As extreme weather events become more frequent and stronger, it is critical that policymakers and development practitioners incorporate climate change adaptation objectives into their sectoral policies and plans. This process, called mainstreaming, has the potential to improve the resilience of development outcomes, contribute to the more efficient use of resources, and avoid investments that unintentionally lead to maladaptation. But mainstreaming requires coordination among multiple actors, institutions, and processes, which can make the journey from a plan on paper to action on the ground slow. WRI has identified factors that can work together, like a set of gears, to help accelerate the move from mainstreaming commitments to implementation. This working paper describes enabling factors in the areas of policy frameworks, leadership, coordination mechanisms, information and tools, and supportive financial processes. Real-world examples demonstrate how they can come together to support implementation. Mainstreaming adaptation into development efforts has the potential to improve the resilience of development outcomes, contribute to the more efficient use of resources, and avoid investments that unintentionally lead to maladaptation. Policymakers and development practitioners increasingly recognize the need to anticipate and prepare for the impacts of climate change and are incorporating adaptation objectives into sectoral policies and development plans. Many tools exist to support these efforts, but mainstreaming plans and policies has been slow to translate into robust action on the ground. This paper describes enabling factors in the areas of policy frameworks, leadership, coordination mechanisms, information and tools, and supportive financial processes that can help bridge the implementation gap. Real-world examples demonstrate how they can come together to support implementation. The impacts of climate change—increasing temperatures, shifting rainfall patterns, extreme weather events, and sea level rise—have significant implications for human well-being and economic growth. They directly affect development strategies and investments in sectors as diverse as infrastructure, agriculture, water, urban planning, and health. Policymakers and development practitioners are increasingly recognizing the need to anticipate and prepare for the impacts of climate change. A growing number of countries are including adaptation objectives in their national and subnational development policies, as well as working across sectors and ministries to integrate resilience strategies into planning. More than 30 developing countries describe in their Nationally Determined Contributions (NDCs) efforts to incorporate adaptation into national development plans or sectoral policies, and more than half of the adaptation actions described by 41 developed countries in their National Communications were incorporated into broader strategies rather than stand-alone adaptation initiatives. The National Adaptation Plan (NAP) process and climate finance institutions are also helping accelerate the mainstreaming of adaptation. Mainstreaming adaptation objectives into development plans and sectoral policies pays dividends. Mainstreaming can increase the likelihood of success of development under a changing climate. It can lead to enhanced results across programmatic objectives, contribute to more efficient use of financial and nonfinancial resources, and improve the sustainability and scale of adaptation efforts. Countries ignore climate risks at their peril: According to one analysis (GCEC 2014), US$90 trillion needs to be invested in infrastructure by 2030 to achieve projected growth. Without adequate consideration of the impacts of climate change, such investments are at risk. Numerous tools have emerged in recent years to support mainstreaming. They can help planners and sectoral experts assess vulnerability; draw up plans that increase resilience; protect investments from climate risks; conduct economic and feasibility analyses of adaptation efforts; and implement, monitor, and evaluate these initiatives. Although the uptake of tools for vulnerability assessment is increasing, few governments are using the full range of mainstreaming tools in their day-to-day functioning. Greater effort is needed to incentivize, support, and otherwise build the capacity of line ministries to move beyond vulnerability assessment to the planning, implementation, and evaluation of mainstreaming efforts. Despite growing political attention and technical tools to support mainstreaming, an implementation gap persists. Efforts to mainstream adaptation into development plans and policies have been slow to translate into robust action at national or subnational levels, undermining the ability to prepare the world’s most vulnerable communities for the climate impacts that lie ahead. A review of more than 100 published cases of mainstreaming efforts finds that although most addressed mainstreaming in policies and plans, only half reported concrete projects and activities (Runhaar et al. 2017). Because mainstreaming requires coordination among multiple actors, institutions, and processes, the journey from a plan on paper to action on the ground can be a slow one. Research suggests that key barriers to implementing mainstreaming efforts include lack of cooperation and coordination among stakeholders and sustained political will and commitment. Policy frameworks, including political commitments, mandates, and laws that support the integration of adaptation objectives into development planning and sectoral strategies. Policy frameworks are more likely to catalyze implementation when they contain mechanisms for accountability or enforcement. Sustained, persistent leadership, from inside or outside government, including by political leaders, bureaucrats, and civil society organizations. Such leadership can manifest itself by heads of state launching new strategies that encourage mainstreaming, ministries creating new institutions, or citizens championing innovative initiatives that accelerate implementation of mainstreaming commitments. Coordination mechanisms across sectors and between government departments, such as interministerial steering committees or task forces, that support shared mainstreaming goals. These systems can cut across policy levels, encompass public and private institutions, and encourage ongoing public engagement. Information and tools, including learning initiatives, training, or access to technical expertise that enables mainstreaming. Knowledge brokers—players that can facilitate information sharing across sectors and policy domains—are critical in bridging the implementation gap. Supportive financial processes that encourage decision-makers to consider climate risks as well as identify, track, and cover costs to adapt. These processes could include expenditure-tracking initiatives, budget-tagging efforts, and special funds governments establish to support mainstreaming. There is a pressing need for ongoing documentation of success in bridging the implementation gap. The challenges of mainstreaming are likely to grow as shifts in governance structures continue to reshape institutional arrangements for policymaking and budgeting. These shifts create new challenges and opportunities for awareness raising, capacity building, and civil society engagement that can support mainstreaming. Analyses and case studies of implementation can provide insights into the innovations that will be needed to strengthen and expand mainstreaming efforts. While many countries have made climate adaptation commitments, few have actually turned them into action. 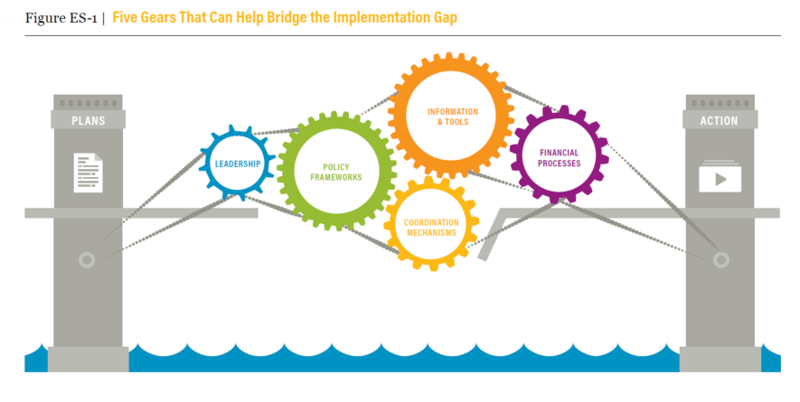 New WRI research details strategies to bridge the implementation gap.